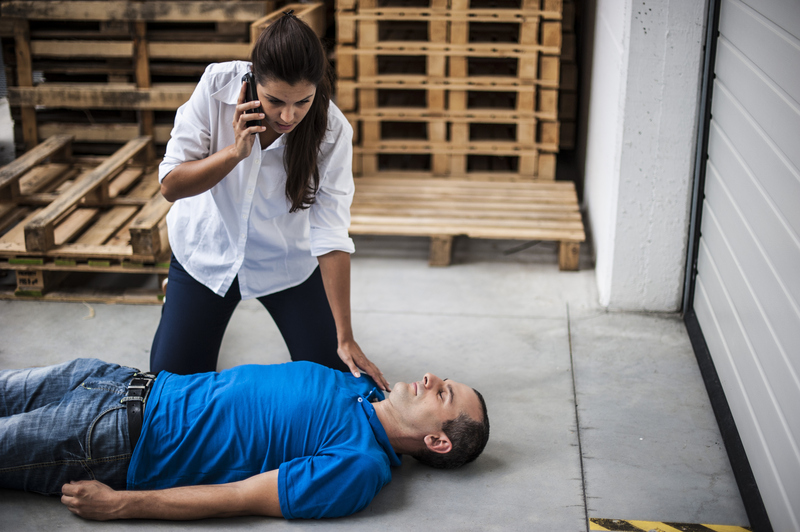 One of the first things you learn when you take a CPR/AED/First Aid class is when you come across someone who is in need of help, assess the scene to make sure it is safe for you to assist the patient. But what, exactly, should you be looking for? Below are just some of the more common scenarios where you may want to take an extra few seconds to ensure you don’t become another victim. Most emergency responders will tell you it’s best to pull over at a safe distance and call 911 if you witness a vehicle accident. If you can, stay in your car and wait until the police arrive as they may want to take a statement about what you witnessed. What are some of the dangers to you as a helper? If someone is injured by industrial machinery, the exact circumstances may not be obvious. If you did not witness the accident, make sure all electricity or power to the device is turned off before approaching. Why? Next, assess the physical location of the victim. If they are in an elevated location such as scaffolding, or if they have been crushed by materials or machinery, you will most likely need help with extrication, and it may be more harmful to the victim unless there is someone there to assist safely and administer advanced first aid immediately upon moving them. This is more about when you are able to approach the patient and start helping them. If they are in cardiac arrest and have a medication patch which must be removed because it is in a location which hampers AED electrode pad placement, make sure you are wearing protective gloves before removing the patch. An alternative is to use a shirt, towel, etc. to remove it. Why? Making sure the people in the area are not a threat can be difficult, but a quick scan of other bystanders is a good idea. Why? Not everyone may be there to help. Another person in the vicinity may be the cause for the person being unconscious through a violent act and may not be happy with you for trying to save them. This is a good way to find other potential helpers to call 911 and get an AED if you think one may be needed. This is another one of those instances where you should be aware of who you are helping and where they are located. If you suspect the person is unconscious and has gone into cardiac arrest due to an opioid overdose, be on alert. Why? Many first-aid kits now include the drug Naloxone (Narcan), which reverses opioid effects. Fast. If CPR is successful and Narcan is administered, the patient may awaken and they will most likely NOT be happy. The last thing they remember was being in a state of drug-induced euphoria and now, because of an oxygen-starved brain, they are not able to control actions and may not even be aware of them. Drowning seems like an obvious instance requiring immediate attention. However, there is one instance where you do not just want to “jump in” and help – Electric Shock Drowning. If someone suddenly appears to go limp in the water, most people’s first instinct would be to dive in and save them, but you should take a moment to assess the situation before reacting quickly. Why? There is a possibility the victim has received an electric shock and the water surrounding them is still electrically charged. By jumping in, you could put yourself in danger as well. The person may still be conscious but panicked, and should be directed to swim AWAY from the area, and if the sensations increase to change direction. Most ESD occurs around docks, boats and metal handrails, areas a victim is likely to swim towards in order to get out of the water. However, getting closer to the source will increase the charge and render them unconscious. They should be told to head toward shore or the side of a swimming pool instead. Bystander intervention in cases of sudden cardiac arrest is critical to survival. In most cases, the scene will be perfectly safe, but by taking a few seconds to evaluate the situation before jumping right in you may avoid becoming the next victim.